Although Dutch cuisine hasn’t done as well globally as Italian or Chinese has, no trip to the Netherlands would be complete without sampling some deep-fried bitterballen or sugar-coated poffertjes. If you happen to be in the Netherlands during a holiday however, it’s worth sinking your teeth into some of the treats that are only prepared for special occasions. From sweet, tasty pastries, to miniature-grilled meats, here are the foods you should treat your taste buds to during the Dutch holidays. One of the best things about the Dutch New Years is the delicious oliebollen they make for the celebrations. These tasty treats are dough balls that can also be filled with raisins, and then fried in oil and served with powdered sugar. 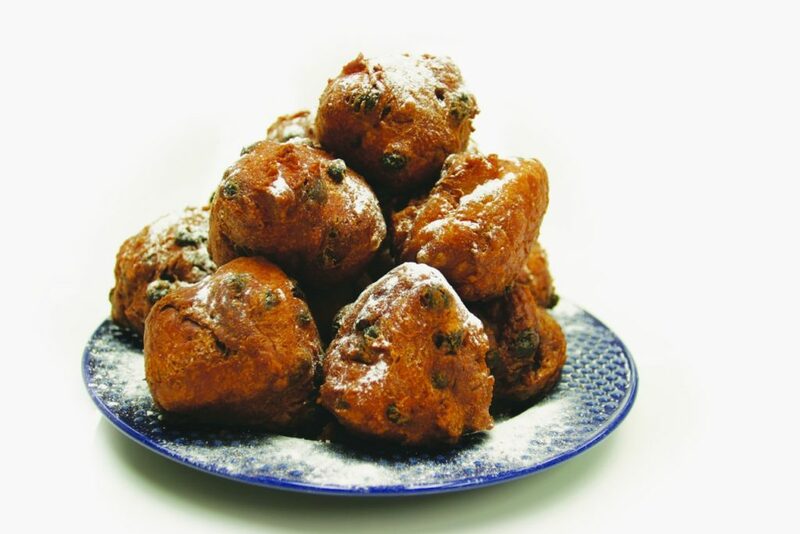 You’ll find oliebollen stalls at markets, and in squares during this time of year, or you can pick up a packet of the mixture from your local grocery store and easily make your own. Just a word of warning before you go devouring your weights worth of these, in English oliebollen literally translates to ‘oil ball’ and, although delicious, they aren’t kind on the waist line. Similar to Oliebollen, but instead filled with apples, these delicious desserts are a combination of apple pie and doughnuts. Deep-fried to perfection, appelbeignets sport a crispy, outer layer with the sweetness of apple oozing out with every bite. Both associated with Sinterklaas, the difference between pepernoten and kruidnoten can start a heated discussion in the Netherlands. Although most people can agree, pepernoten tend to be fairly chewy and randomly shaped, while kruidnoten are harder and are more round in shape. 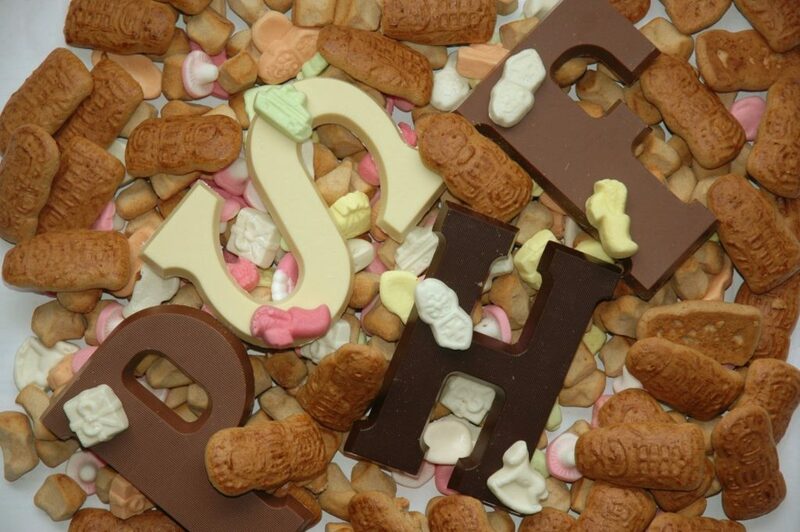 During Sinterklaas, children are traditionally given their initials made out of chocolate. They are made from dark, milk, or white chocolate and come in a variety of sizes. Decorated with nuts and fruit or plain, chocoladeletters are lekker all the same. Traditionally, Sinterklaas puts the letters in the shoes of children the night before, so they will wake up on the 5th of December to the surprise. With many spices like cinnamon, nutmeg and ginger, speculaas are thin, gingerbread-like cookies. Those familiar with kruidnoten will recognize the taste of speculaas, as they are made from mostly the same ingredients. You can find speculaas in a variety of typical Dutch shapes, from windmills to people. Schuimpjes are a sweet and soft, sugary candy that come in a variety of colors and shapes. Depending on the added tasting, they can taste like a variety of different flavors, and all the shapes are Sinterklaas related, from presents, to Sint himself. Also known as Dutch mulled wine, there’s nothing more comforting than a cup of this warm, sweet brew when the weather is cold and rainy. It’s said that bischopswijn is Sint’s favorite, which is why it’s drunk before and during Sinterklaas. The drink is pretty much the same as regular mulled wine, except that it’s only made traditionally with orange, whereas mulled wine can be made with all citrus fruits. This traditional way of eating involves putting a hot plate in the middle of the table and each person cooking their own mini pieces of meat and vegetables. Usually brought in a packet set from Albert Heijn, some things you’ll fry include biefstuk (beef steak), kip (chicken) and worstjes (mini sausages). Dessert is often also cooked on the hot plate (after it’s been wiped down from dinner) and is usually pancakes, which are served with a variety of toppings. Gourmetten is a fun and sociable way to dine, which is why it’s usually reserved for a time when the family is all together. Kerstkrans (which in Dutch means wreath) is a Christmas wreath of golden puff pastry filled with almond paste. Topped with glace fruits and offering a buttery taste when bitten into, the almond paste in the kerstkrans can take up to a month to prepare if you plan on making it yourself from scratch. Flavored with cinnamon, almond flakes, and crystallized sugar, Jan Hagel cookies are a traditional Christmas snack in a lot of Dutch households. Serve with ice cream, whipped cream, and with coffee on the side. A mixture of ground almonds with a lot of sugar or honey, marzipan can be made into all shapes and colors. From pieces of fruit, to animals, this sticky mixture can take the form of just about anything you can image. It’s extremely sweet, but enjoyed by most in the Netherlands around this time of year. Traditionally, marzipan figures are gifted as presents during Christmas, often on Christmas Eve. Although tompouces are usually decorated with pink icing, on King’s Day they wear orange to match the rest of the country. 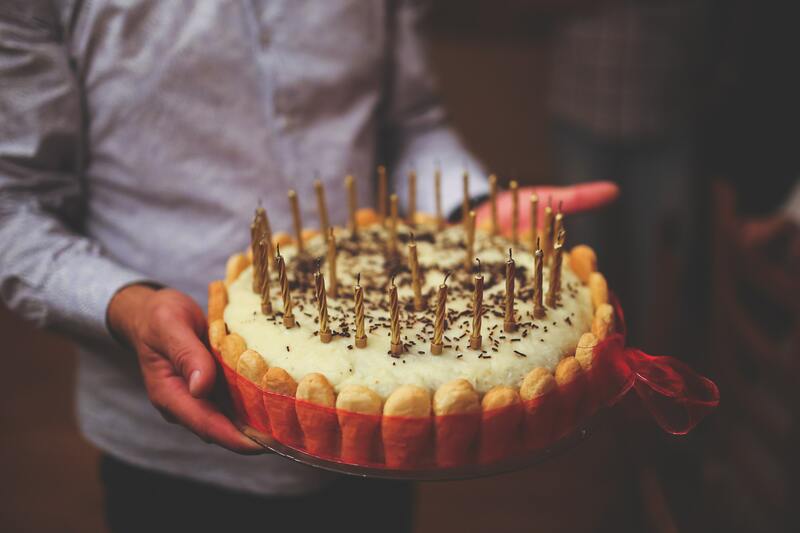 This sweet pastry is loaded with cream and sales for them can increase by as much as 60% on the King’s Birthday. If you’re celebrating King’s Day in the Netherlands, you shouldn’t resist trying one of these sweet treats. Round in shape, with the texture of a cracker, beschuit is a Dutch crisp that gets smeared with butter and then coated in either pink or blue sugar-coated aniseeds, known as muisjes. Only served during a baby shower, or when guests come to visit a newborn, if these treats are pink it means the baby is a girl, and they’re served blue if a boy is expected. Mainly served in the south of the Netherlands, vlaai (also known as Limburgse vlaai) is a large, flat pie or tart filled with sugared fruits, covered with a dough grid and served on birthdays (brought by the person who’s birthday it is, of course). It’s available with many different fruit fillings, such as cherry, apricot, strawberries and plums – all equally delicious. Similar to a doughnut, this deep-fried pastry has a knotted shape and hails from Limburg. Although traditionally associated with carnaval, nonnevots can be found year-round in regional bakeries of the south. Come Easter morning, it’s more likely than not that you’ll find a loaf of paasbrood on the kitchen tables of the Dutch. An Easter breakfast staple, this traditional treat is rich fruit bread, often with an almond paste filling.